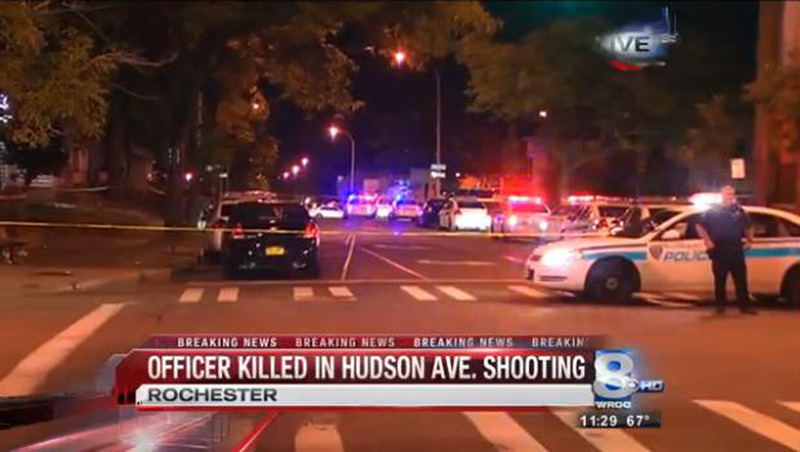 ROCHESTER, N.Y. - A Rochester police officer was killed during a shootout Wednesday night, the first member of the city's police force to be killed in the line of duty since 1959, officials said Thursday. The officer was shot just before 9:30 p.m. Wednesday, while in pursuit of a suspect, Rochester Police Chief Michael Ciminelli said. According to CBS affiliate WROC, the officer was responding to a call about a fight. Ciminelli said the suspect was wounded in the exchange and was in surgery early Thursday. The station reports that a bystander was also struck and sustained non-life threatening injuries. Police have not yet released the names of the officer, suspect or bystander. The officer was taken to Rochester General Hospital, where he died. The others were taken to Strong Memorial Hospital. "It is with a sad and heavy heart that I come before you to announce that tonight we lost one of our own," Ciminelli said at an early Thursday news conference. "A police officer who gave his life in the line of duty, who made the ultimate sacrifice protecting the people of Rochester. Ciminelli said there are no other suspects and that an investigation was continuing. Rochester Mayor Lovely A. Warren asked the community to keep the officer's family in their prayers. "Words simply cannot express the sense of sorrow and deep loss that we feel at this moment," Warren said. "A family has lost a loved one. The men and women of our police department have lost a family member and a friend. And we the people of Rochester have lost someone, who like every other RPD officer, put their life on the line day after day, for us." Before the news conference, dozens of police officers met with the mayor and police chief at Rochester's public safety building, some reportedly in tears.